I’m the type of person who has a hard time sticking to any fitness routine for any length of time. I am notorious for getting fitness videos to workout to in my living room. I’ve done Tae-bo with Billy Blanks and more recently the 30 Day Shred and Six Week Six Pack with Jillian Michaels. (Note that I did not stick with these long enough to either become shredded, or get a six pack) I enjoy them for a while but can’t seem to commit for much more than a few weeks. I’ve tried the gym and it just isn’t for me. I can’t get past learning all the gym etiquette much less muster up the motivation to make sense of all those machines. I’ve tried taking classes with the latest fitness trends: there was Jazzercise and Zumba … but I eventually grew too bored (or too broke) to keep up with them. I’ve heard great things about Yoga and have wanted to try it for a while – okay, years. As a person who works at desk all day, then comes home to write at a laptop, I thought I could benefit from some yoga. Yoga is known to strengthen and stretch the muscles and improve flexibility, improve blood circulation, counteract stress, and improve flexibility. Whenever I am interested in learning more about something, one of the first things I do is read about it. So naturally I ran (drove – I do not run) to my local library and picked up a stack of books and DVDs on the subject. NOTE: There are several different methods of Yoga, all which have different benefits – they’re not all about bending yourself up like a pretzel! My practice so far has consisted mostly of Hatha and Vinyasa Yoga. After doing some initial research, I hopped onto YouTube and found Yoga with Adriene. Her beginner videos felt like just the right place to start. They were introductory in their style with helpful hints about focusing on breath, and connecting to the earth. Her Foundations of Yoga videos are a great way to get comfortable with various poses. Then I found DoYogaWithMe.com – tons of completely FREE videos you can stream online! The videos are high quality and with so many to choose from you’re sure to find something that feels good for you. What’s so great about this site is that you can sort the videos by level and/or length and focus on your needs. In last month or so, I have added yoga to my life slowly, anywhere from 2-5 times a week as my schedule allows. What I love about yoga is that I don’t need to rework my schedule to fit in a little bit each day. I can start by waking up 20 minutes earlier and doing some gentle yoga to start my day, or do a longer routine to unwind after work or before going to bed. Just a week or so ago I woke up feeling tense and seriously achy. I did a twelve minute yoga routine for the neck and shoulders and felt so much better afterward! 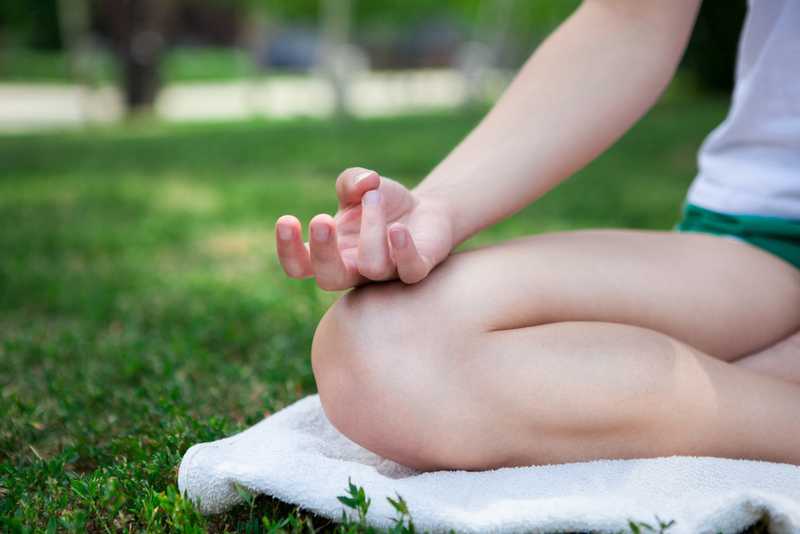 If you are interested in yoga, here are a few tips for getting started. Begin by learning some of the basics and vocabulary of yoga. If you jump right into doing yoga without understanding the language and poses, you may get a little hung-up. A few basic poses I learned before beginning were child’s pose, cat/cow, cobbler’s pose, and the well-known downward dog. Be sure to start with routines like gentle yoga or yoga for beginners before moving on to more advanced routines and strenuous poses. Start with what feels good! Visit DoYogaWithMe.com and be sure to check out the office yoga videos for short sessions focusing on the neck, back and shoulders. When you’re feeling tense during the workday or during a long writing session, take a break to stretch for a few minutes every hour or so. Find a short yoga routine you can do in your office, or even right in your chair! If you suffer from wrist pain from long hours at the keyboard like I do, check out the five minute stretching routine for the wrists and Yoga for Carpal Tunnel Syndrome. Finally, I feel I have found a routine I can commit to. Granted, I’m not exactly doing cardio with this practice and don’t expect to see me standing on my head anytime soon. But I have immensely enjoyed the stretching and relaxation that yoga has brought to my life. I’d love to hear from you! Do you practice yoga? Do you want to start? Feel free to share your experience in the comments below. This entry was tagged Health and Wellness, The Writing Life, Writers, Yoga. Bookmark the permalink.